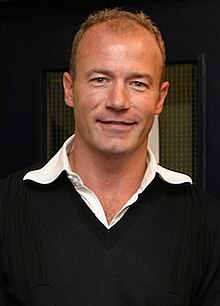 Alan Shearer, CBE, DL (/ˈʃɪərər/; born 13 August 1970) is an English retired footballer. He played as a striker in the top level of English league football for Southampton, Blackburn Rovers, Newcastle United and the England national team. He is Newcastle's and the Premier League's record goalscorer. He was named Football Writers' Association Player of the Year in 1994 and won the PFA Player of the Year award in 1995. In 1996, he was third in the FIFA World Player of the Year awards. In 2004 Shearer was named by Pelé in the FIFA 100 list of the world's greatest living players. 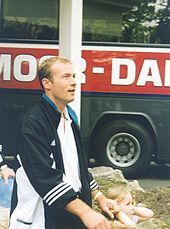 1 2 Whilst Shearer holds the record for goals scored in the Premier League, formed in 1992, the record for goals scored in the top flight in English football is 357, held by Jimmy Greaves. 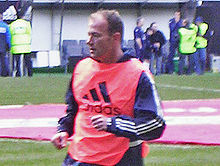 Shearer has scored 283 top flight goals, including 23 in the Football League First Division. - "England - All-Time Topscorers". Rec.Sport.Soccer Statistics Foundation. Retrieved 30 November 2017. ↑ "Birthday Honours List, 2016". BBC. 10 June 2016. Retrieved 10 June 2016. ↑ "Pele's list of the greatest". BBC. 4 March 2004. Retrieved 22 November 2013. 1 2 "S is for Shearer". The Football Association. 18 July 2007. Archived from the original on 10 December 2008. Retrieved 13 August 2008. ↑ "FWA FOOTBALLER OF THE YEAR AWARD". Football Writers' Association. Archived from the original on 19 September 2008. Retrieved 25 July 2008. ↑ "1994/95". Premier League. Archived from the original on 14 May 2008. Retrieved 2 August 2008. ↑ "A History of the Premier League". Premier League. Archived from the original on 18 November 2011. Retrieved 28 July 2008. ↑ "today's top 20: most Premier League goals in a season (1992–2007)". The Independent. 21 September 2007. Archived from the original on 6 December 2008. Retrieved 26 July 2008. 1 2 "Season 1995/96". Premier League. Archived from the original on 30 October 2011. Retrieved 22 July 2008. ↑ "Blackburn Statistics | Alan Shearer hits the net". Shearer9.com. 30 December 1995. Archived from the original on 16 October 2015. Retrieved 27 June 2014. ↑ Hughes, Rob (30 July 1996). "Newcastle United Pays Record $23 Million for Shearer". International Herald Tribune. Archived from the original on 27 September 2011. Retrieved 21 July 2008. ↑ Randall, Colin (30 July 1996). "Shearer is going home for £15m". The Daily Telegraph. London. Archived from the original on 12 March 2005. Retrieved 21 July 2008. 1 2 "Season 1996/97". Premier League. Archived from the original on 25 June 2008. Retrieved 21 July 2008. ↑ "Season 1994/95". Premier League. Archived from the original on 16 September 2008. Retrieved 22 July 2008. ↑ Hodgson, Guy (27 August 1999). "Shearer's Doom Army at the gates of Gullit". The Independent. Retrieved 21 July 2008. ↑ Malam, Colin (27 February 2000). "Shearer decides to quit England". The Daily Telegraph. London. Archived from the original on 11 September 2005. Retrieved 21 July 2008. ↑ Aizlewood, John (6 February 2005). "The top 10 Roy Keane battles". The Sunday Times. London. Archived from the original on 9 March 2007. Retrieved 21 July 2008. ↑ "Batigol: Shearer is the greatest". Sky Sports. Retrieved 16 August 2018. ↑ "Modern Magpies 2002/03: Champions League – We Had A Laugh!". Newcastle United F.C. Archived from the original on 12 January 2009. Retrieved 21 July 2008. ↑ Stewart, Rob (2 April 2005). "Newcastle say Shearer is manager in waiting". The Daily Telegraph. London. Retrieved 21 July 2008. ↑ "Legends Jackie Milburn". Newcastle United F.C. Archived from the original on 7 October 2008. Retrieved 14 October 2008. ↑ Taylor, Louise (4 February 2006). "St James' joy at Shearer record". The Daily Telegraph. London. Retrieved 21 July 2008. 1 2 Stewart, Rob (12 May 2006). "Shearer earns tearful tribute". The Daily Telegraph. London. Retrieved 21 July 2008. ↑ "England Under-21 Goalscorers". The Football Association. Archived from the original on 6 April 2005. Retrieved 22 July 2008. ↑ "England Under-21 Caps". The Football Association. Archived from the original on 3 April 2005. Retrieved 22 July 2008. 1 2 "The Shearer Era – Facts And Figures". Newcastle United F.C. Archived from the original on 8 October 2008. Retrieved 6 August 2008. ↑ "Eureka! Spot-on Shearer has formula for perfect penalty". The Northern Echo. 23 June 2006. Retrieved 12 August 2008. ↑ "The next generation". The Football Association. 4 July 2008. Retrieved 5 July 2009. ↑ Winter, Henry (10 January 2008). "No time for Allardyce; wrong time for Shearer". The Daily Telegraph. London. Retrieved 23 July 2008. ↑ "Shearer turns down Magpies coaching role". FIFA. 2 February 2008. Archived from the original on 5 April 2009. ↑ "NUFC Statement – Alan Shearer". Newcastle United F.C. 1 April 2009. Archived from the original on 30 September 2012. Retrieved 22 January 2011. ↑ "No. 61608". The London Gazette (Supplement). 11 June 2016. p. B10. ↑ "Alan Shearer statue unveiled at St James' Park". BBC News. 12 September 2016. Retrieved 7 February 2017. ↑ James, Paul (9 February 2007). "Shearer's gift is a new way to care". Journal Live. Retrieved 24 July 2008. 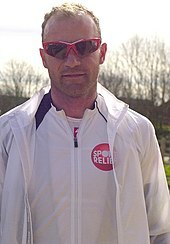 ↑ "Shearer donates testimonial proceeds to charity". Ireland Online. 28 March 2006. Archived from the original on 8 January 2009. Retrieved 24 July 2008. ↑ "Alan Shearer - Premier League playing career". Premier League.com. Retrieved 16 August 2018. ↑ "Alan Shearer - Goals in International Matches". Rec.Sport.Soccer Statistics Foundation. Archived from the original on 5 February 2015. Retrieved 27 June 2014. 1 2 3 4 "Alan Shearer: Overview". Premier League. Retrieved 18 April 2018. ↑ "Torres receives adidas Golden Boot". UEFA. Retrieved 21 January 2015. ↑ "1996 team of the tournament". UEFA. Retrieved 21 January 2015. ↑ "Ronaldo honoured at Lisbon Gala". FIFA. Retrieved 21 January 2015. 1 2 3 4 "For the record: Premier League facts and figures". Premier League. 11 March 2018. Archived from the original on 31 March 2018. Retrieved 3 April 2018. ↑ Held jointly with Andy Cole. ↑ Held jointly with Sergio Agüero, Dimitar Berbatov. Jermain Defoe and Andy Cole.